This recipe is a perennial crowd pleaser. Everyone who has ever tasted it, loves it. The salad ingredients are simple, nutritious foods you can find in any home refrigerator or pantry. The dressing, however, is what makes the flavor profile anything but ordinary. The best part about this recipe, though, is its versatility. 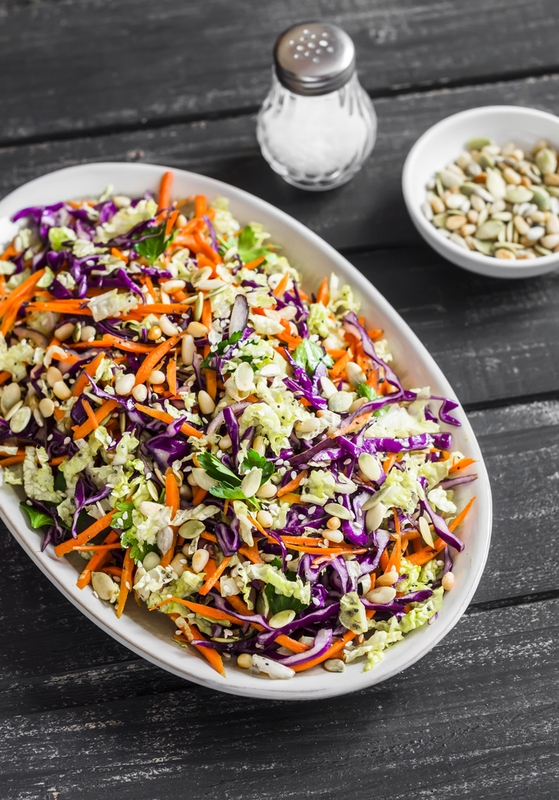 Make it a side salad for your next barbecue, top it with grilled chicken for an entree salad, serve it alongside your morning omelet, or add it to your favorite burger for a blast of flavor, color and crunch...the uses are endless. Either whisk or blend the vinegar, maple syrup, lime juice, ginger and salt until well combined and salt is dissolved. Gradually add the toasted sesame oil until well combined. Set the vinaigrette aside so the flavors can meld. Combine all salad ingredients in a large bowl until evenly distributed. Toss the vinaigrette with the vegetables until completely coated. Garnish with chopped peanuts and pepitas, if desired. Let marinate in refrigerator for 20 minutes before serving.